When the District was first formed the vision of the developers was for an equestrian community. The developer built and owned the Equestrian Center (now known as the Colorado Horse Park) as part of the overall development. 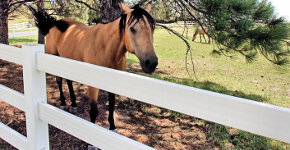 A network of trails for riding horses was created so that horses from the Equestrian Center could use the riding trails to access homes in community. The developer granted an easement to the District for the maintenance and enforcement of the rights granted by the easement. Many of the trails and much of the road right of ways were delineated by fencing. Over the years the District has replaced much of the original fencing with white decorative, three-rail fence as funding was available. The District maintains the fencing to this day.